Recent statistics have indicated that nearly nine million American children are categorized as “overweight”. Buying or making clothes for the plus size child can be a very stressful and difficult process as there is literally NO standard size that fits properly. We are excited about our line of clothing patterns for plus size children that we designed according to actual REAL measurements of plus size children, so that patterns will fit the majority of plus size children, are now available at http://SewWithSarah.com. Compare our pattern measurements to your child’s and you’ll see which size range you’ll need. Each pattern has an enlarged view (click on the pattern number link), which gives the measurement chart for each size range, as well as the fabric requirements for each pattern. My friend has a 9 year old daughter who has a 36″ chest, 34″ tummy and 38″ hips. Buying pre-made clothes for her is impossible since a skirt that fits in the waist has a length that goes past the feet, and long sleeves hang several inches below her fingers in order to get a size that fits in the chest and shoulders. My friend decided to try making some clothes, only to find similar problems with patterns. Thinking the new “plus” sizes would fit, she was disappointed to find that, while a 16 Plus would fit the chest, the “waistline” hung about 2-3 inches below her waist, the skirt length was way too long, the neck and armholes were much too large and the shoulder width fell way off the shoulder. After all, the measurements used in the store-bought patterns are for a “chubby” 16 year old, they’re not designed for an extra chubby 9 year old. If you are sewing for hard to fit plus size children, these patterns might just be the answer to your fitting issues! Check them out now and get 15% off all plus size kids patterns with promo code PLUS15 – good through April 30, 2015..
Scissors play a very important part in the sewing process, and are not something to be thought lightly about. Only a minimum of care is needed. They should be kept clean by cleaning off the lint after each use. The screw should be lubricated with sewing machine oil occasionally. Avoid cutting over pins, and protect the points during use and when they are stored. Use the scissors and shears only in ways and on materials for which they were intended, and they will last for a good number of years. 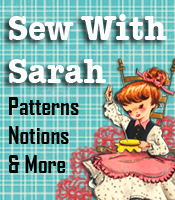 For other sewing tips and tutorials, visit SewWithSarah.com. Button, Button, Who Has …..
the prettiest button? The answer is: the gal wearing the most eye-catching, zingiest buttons, the ones that absolutely make an outfit! Perhaps she has jewelry to match. Maybe she made the buttons herself! Any way you look at it, the button game is one that we could all easily play, if we just take a little time to think about what all we can do with buttons. There are many handy products that can result in fashion magic, as far as buttons are concerned. The matching jewelry mentioned above is achieved easily by purchasing earring bases which are especially made for attaching buttons. You can mount your favorite commercial or home-covered buttons on silver or gold findings for shank or clasp earrings, scatter pins, cufflinks, tie tacks or finger or scarf rings. The list just given could keep you busy for several hours! Covering buttons is a cinch with the proper equipment. Many garments look fabulous with large or small covered buttons, then add earrings to match to complete the look. There are several types of kits for covering buttons, and the kits come in a variety of sizes and in styles of half ball, flat, two-tone (a half ball plus a rim, each separately covered), and the kind with a metal rim and fabric covered center. Commercial buttons offer such a myriad of intriguing designs that a display of them looks like a hobbyist’s collection. You can get small to large round, square, triangle and assorted shapes that can be plain through such designs as flags, liberty bells, eagles, baseball decals – you name it, you can find buttons to meet the need. In addition to shapes and sizes, materials that buttons are made of also lend unique qualities. There are porcelains, glass, wood, metal and plastic buttons. The influence of cultures from all around the world is seen in various button designs. Don’t just put buttons on your blouses and dresses – buttons have dozens of applications. Use buttons as decorations on purses, tote bags, on your shoes, on a belt or make scatter pins from decorative buttons. Use buttons as part of decorative wall hanging, or let the kids have a length of yarn, string a few large buttons on it and tie the ends for a perfectly good necklace. What other uses can you come up with for buttons? Let us know and we’ll pass them along to our readers. From time to time we try to give updates and information on how to increase your sewing business. Expanding the sewing and craft business is necessary in order to “increase the bottom line”. How much sewing do you do for men? If anybody answered that they actually DO sew for men, how difficult is it to get the patterns adjusted for those “not so average” sized men? I’ve been there and done that! Even if you have a nearly average man, there may be extra broad shoulders, longer than average arm, and other not so average challenges to deal with. Then we move on to the big, tall and husky men! These men may be tall, BUT there also are short, stocky and the type whose chest has fallen and now has “dunlopped over the belt” (that’s my brother’s story, and he’s sticking to it!). In other words, the big bellies! We do now have available a pattern making class for big husky men that we believe could help dramatically increase your sales for the year! After reviewing and learning the steps to make patterns according to the individual measurements of those super hard to fit men, you will certainly have the corner on the market in that area. Look around the next time you’re out and about and see how many men fit into the husky, overweight and super hard to fit category. These are all potential customers. It would not be difficult to bring in dozens of new customers — just get the first customer, make some clothing garments for him and soon the whole town will know about your sewing skills! Even those men who appear to be “average” have fitting issues with broad shoulders, long torsos or other fitting issues. You can make patterns easily to fit those men also by checking out our pattern making class for “nearly average” men. Start now and see how quickly you can raise your bottom line by venturing into new areas of sewing!